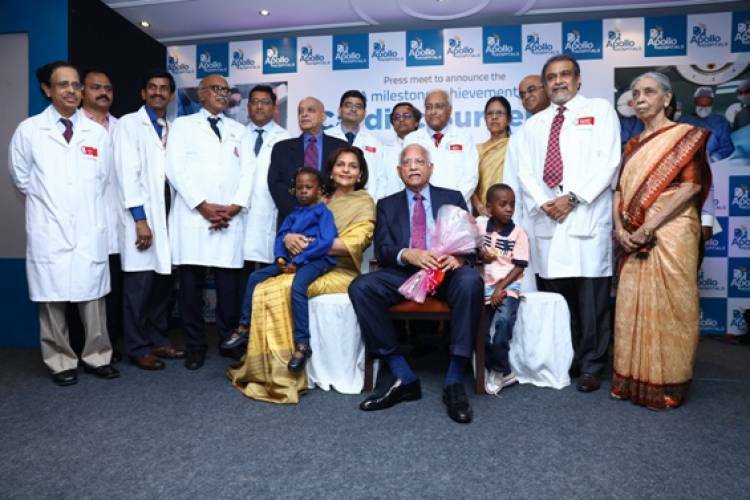 Chennai, December 4, 2018: Apollo Hospitals Enterprise Ltd. (AHEL) (BSE: 508869/ NSE: APOLLO HOSP), Asia’s largest and most trusted multi-specialty chain of hospitals, today announced the successful completion of more than 50,000 cardiac surgeries at the Chennai flagship hospital. This new milestone in Cardiac Surgery was achieved with superior outcomes on par with international standards. The over 50,000 cardiac surgeries include complex procedures like Bypass, Valve replacements, Pediatric cardiac procedures, Transplants and Minimally invasive procedures. Apollo Hospitals pioneered open heart surgery and cardiac catheterization in the early 80s and since then has brought the latest medical and diagnostic tools to lead the way in cardiac care to give patients accurate diagnosis and effective treatment. From the 320 slice CT Scanner, 64 Slice CT Angiography, Transoesophageal Echocardiography (TEE), Stress Echocardiography and Electrophysiology (EP) Study to an advanced infrastructure that includes third generation Cath Labs, Cardiac Critical Care Units and Intensive Care Units, Apollo Hospitals has been at the vanguard in heart care. After milestones with advanced procedures such as the first Coronary Artery Stenting, first keyhole multiple bypass surgery, and first heart transplant in India,this milestone of over 50,000 cardiac surgeries at Apollo Hospitals Chennai is another feather in the cap for the group. The pioneering work done at the hospital in the prevention and treatment of cardiac diseases has led to better outcomes and improved quality of life for thousands of cardiac patients. At the same time, Apollo Hospitals has also been working to prevent heart disease through preventive health checks. The Apollo Healthy Heart Program is India’s first Heart Disease Prevention and Reversal program. An evidence-based scientific program, it helps to identify the risks and equips every individual to lead a healthy lifestyle. Apollo Hospitals redefined Heart Care in the country since it began its journey of healing in 1983 with its first cardiac surgery to repair an Atrial Septal defect. Today, Apollo Hospitals Chennai is regarded as among the best hospitals for heart care with a multitude of treatments and procedures in cardiology and cardiothoracic surgery being performed every day. Apollo Hospitals started the Beating Heart Surgery Programme in 1997 and 22,300 beating heart surgeries have been performed till date. This changed the course of Coronary Artery Bypass Grafting (CABG) at Apollo Hospitals Greams road with excellent results reducing the mortality rate considerably on par with Cleveland Clinic bench mark. Moving forward, Apollo hospitals started using arterial grafting including LIMA – RIMA ‘y’ grafting especially for young patients using beating heart surgery. In 2007, Apollo Hospitals started the Minimally Invasive Programme for valve replacement, adult congenital heart defects and single vessel bypass grafting through a small 6 cm skin incision. Minimally invasive procedures were also performed with Robotic assistance. Even a large Ascending Aortic Aneurysm Repair (which is abnormal enlargement of main blood vessel) along with Aortic Valve Replacement was done through a mini incision.